To this day, Canarsie Cemetery has remained a community cemetery, serving the people of Canarsie, as well as anyone who choose to enjoy our beautiful and serene landscape. Although the cemetery adjoined the church, and at times was cared for by the church it was never actually owned by the church. The land was sold to the Town of Flatlands by John Remsen for $75.00, with the intent that it be used as a burial ground, and, as such was from the very beginning, a non-sectarian cemetery. The GAR Plot in Canarsie Cemetery is an area, which was designated for the interment of Civil War veterans and, in some cases, their spouses. 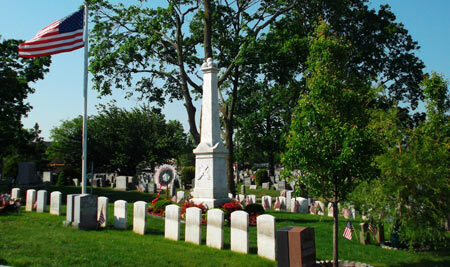 In the center of the plot sits a large white obelisk inscribed with the annotation, “Ford Post 161.” In 2012, Canarsie Cemetery planted a weeping willow tree in memory of these heroic veterans. Every year, on Memorial Day, local veterans’ organizations and members of the community perform a wreath-laying ceremony as a tribute to those interred there. Pursuant to the Laws of 1901, the Trustees of Canarsie Cemetery were local residents appointed by the Mayor for a three-year term “to take charge of and regulate all matters pertaining to the proper conduct and preservation of the cemetery…” The first class of trustees was appointed on April 20th, 1903, and successive classes of trustees continued to be appointed and served into the 1940s. The trustees played an integral part in the growth of the cemetery. 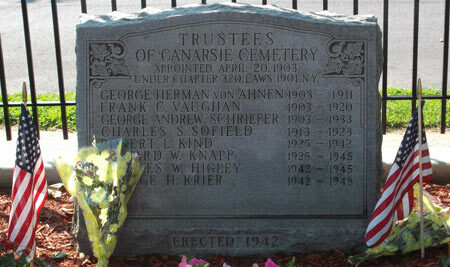 Several of the trustees are interred in the Cemetery, most notably Frank C. Vaughn, whose actions were directly responsible for the passage of the 1901 law ensuring the preservation of Canarsie Cemetery. The “Poor Ground” at Canarsie Cemetery is an area which was designated for the interment of unidentified or indigent individuals. The Poor Ground contains approximately 300 interments. Few if any graves in this area have monuments or are marked in any way. 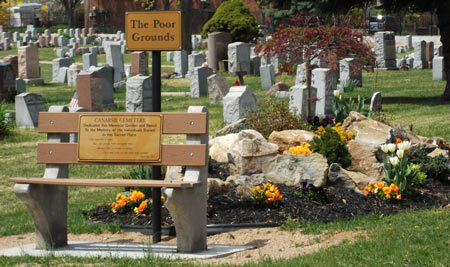 Thus, in 2013, Canarsie Cemetery installed a rock garden featuring a maple tree, and a bench bearing a plaque dedicating the memorial garden and bench to the memory of the individuals interred in the Poor Ground.